You may feel that you have simply blinked your eyes, and your baby is already six months old. She is growing so quickly, and she is learning something new every day. She'll continue to discover new skills as she progresses through babyhood, and you can expect a lot of changes in the next six months. While not every baby develops at the same rate, the following developmental stages are what babies between the ages of seven and twelve months may typically experience. If you feel, however, that your baby is not developing properly, you should contact your pediatrician about your concerns. By now your baby may have mastered the art of movement, as noted by WebMD. In fact, you may place him on the floor, turn your back for a moment, and discover that he has moved several feet away. He may not be crawling yet, but that won't stop him from reaching his desired destination. Some babies move by scooting on their bottoms, pushing themselves backward on their tummies, rolling, or rising to their hands and knees and then flopping forward. These may be preliminary crawling movements, but some babies never actually crawl at all. They simply progress from creeping to pulling up and walking. The age of a baby and the type movement he uses will vary greatly for each individual child. By the time your baby is eight months of age, she should be able to sit well with assistance, and she may even be able to sit up on her own by this time, as noted by the American Pregnancy Association. Don't be surprised to find her sitting up in her crib one day when you walk into her room. She'll probably greet you with a big smile, too. Most babies handle table foods well when they are mashed up with a fork. If there is a family history of allergies then it's best to delay highly allergenic foods like eggs or wheat products. Solid foods aren't so important at this age. 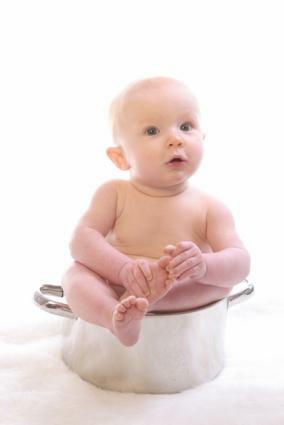 Your baby's primary food should still be breast milk or formula. If your baby is going to crawl, he may be doing it by this time or in the next month or so. You may discover that your baby loves to cruise around the furniture. Once he is able to sit himself up, the next step will be to maneuver himself over to a piece of furniture, pull-up, and eventually walk beside the furniture. When he gets a little braver, he'll let go and tentatively take a few hesitant steps before dropping to the floor. He'll still enjoy being read and sung to, and he'll also enjoy toys that he can stack or push and pull. He will be curious about how things work, so give him plenty of age appropriate toys to encourage this curiosity. Many babies at this age become fascinated with any toy which makes a noise. Your baby's first birthday is fast approaching. She's learned so many skills already, and she has developed quite a personality. You may notice that your little one is a little bit of a show-off, and it isn't any wonder! She probably has a continuous audience of family members and friends. He may be taking a few steps. Some babies have already mastered the art of walking, at least enough to get them from one place to another fairly quickly. She may be able to feed herself simple finger foods, but you should still avoid giving her foods that are choking hazards, such as nuts, grapes, hot dogs, peanut butter, and hard candies. He will still enjoy reading books with you, and you may discover that your little one loves to move to music. There are many educational videos and CDs that play lots of fun songs which encourage your baby to move to the rhythm. Don't be surprised if your baby is very attached to you and has some separation anxiety, as noted on Baby Centre UK. He may cry when you leave him because he doesn't understand the concept of time yet. Be sure to give him plenty of extra hugs and kisses before you leave and when you return. Eventually, he'll realize that you may leave, but you will come back. This first year has flown by. Your little one has finally reached her first birthday and reached many of her first developmental stages. Of course, you'll want to celebrate, but you should remember that she is still little and may be overwhelmed by a too large celebration. Be sure to spend lots of time cuddling her during the day of the party. Remember, the next year will fly by just as quickly, so don't forget to capture as many memories as you can with a camera.